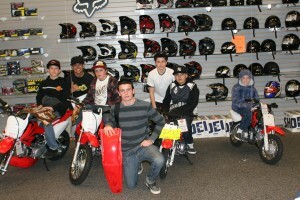 Contra Costa Powersports celebrated their one year anniversary last night with a jam packed Open House. Suzuki riders Ryan Dungey, Ryan Morais and Martin Davalos were at the store signing autographs, taking pictures and talking about the RMZ line of Motocross bikes. In the supercross standings Lites Class, Ryan Morais on the Suzuki RMZ250 is currently in 4th place, only 11 points out of first. In the supercross class, Ryan Dungey is in 3rd place on his Suzuki RMZ450, trailing leader Ryan Villopoto by just 14 points. Just inside the front door, Ann was selling Limited Edition Ryan Dungey t-shirts that we were able to get from Fox Racing. 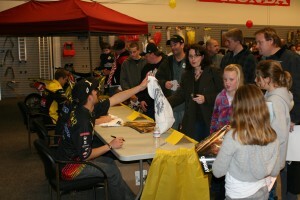 These high quality 100% cotton t-shirts made great souvenirs for the Suzuki racers to sign. A small quantity of these shirts are still available at the Parts Department at Contra Costa Powersports for $10 each while they last. 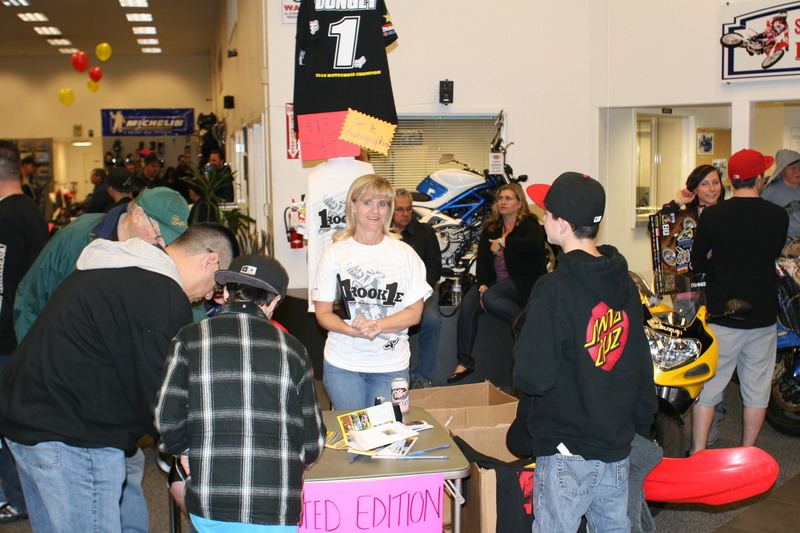 With just over 500 people attending some time during the evening, the store was filled with excitement for both the riders and the upcoming supercross race in Oakland. Giving away a brand new Suzuki MX bike helped attract the crowd. It was fun to see a lot of our current customers and to meet a lot of new customers who had never been to the store before. There were also loads of future supercross champions in attendance. From the 8 week old dressed in the Suzuki Rockstar Jumpsuit, to the 12 year old guys talking about the doubles they’re clearing on their Suzuki RMZ250, the kids were definitely represented. 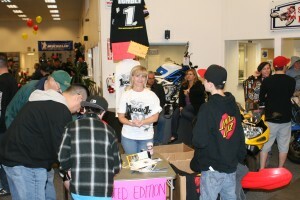 All who attended were entered into a drawing to win a brand new RM85. In addition, the Contra Costa Powersports parts department gave away over $1,000 in accessories and apparel to those in attendance. A big thank you goes out to Fox Racing, Tucker Rocky, Parts Unlimited and Western Powersports for their generous contributions towards the door prizes. 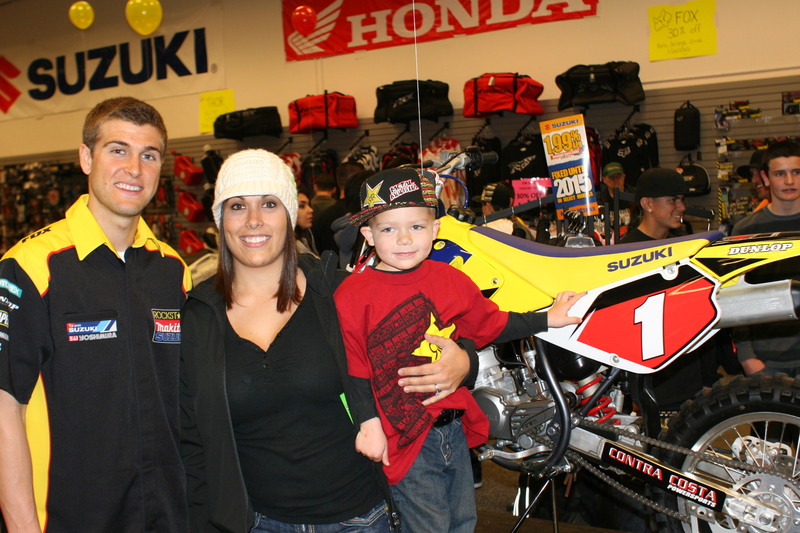 Congratulations to Danelle Schweiger of Clayton, CA who was the winner of the Suzuki RM85. Danelle and her family were one of the first fans to arrive for the evening and are glad they stuck around. The winner had to be present and the first person selected for the Grand Prize (name withheld) didn’t stay around for the RM85 drawing. Ryan Dungey (pictured with the lucky winner) pulled the lucky entry form just before leaving for the evening. This entry was posted in Events on January 29, 2011 by Dave.